make it perfect: .Bring on Spring!. While the North of the country is delighting in warm, sunny days...we are experiencing rain, rain, rain, wind, wind, wind, cold, cold, cold. The kind of weather that I LOVE when I am home alone with the heater turned right up - but not so much fun when you have three little ones in tow. They are really feeling housebound. Our backyard is a sludge of swampy grass. I couldn't send them out there even if I wanted to. I think they would drown!! Our heater has broken and we like a hot house! Should only be another day or two until it is fixed but for now we are trying to heat the lounge room with a little oil column heater...its taking the chill away but isn't toasty at all. 1. 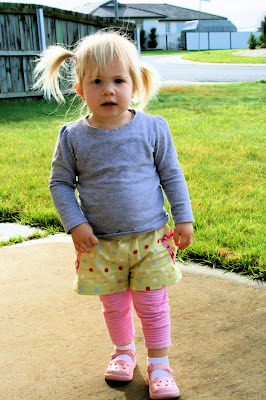 Lil is being dressed in SHORTS worn OVER tights. We are trying to summon some warmer weather in any way we can. Hopefully the appearance of summer clothing will hurry things along! (If not, she is looking mighty cute anyway!!) 2. Yesterday I took the kids to the movies. Oscar has only been once, and Lil never. Thought it might be nice to do something different to break up the week. 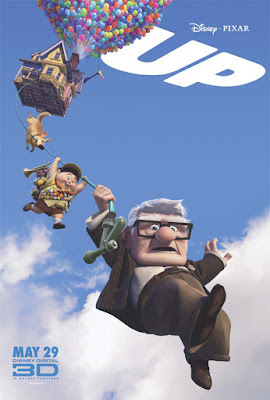 Have you seen Up? So very cool and funny! Cade came with us, I think we enjoyed it more than the kids! I figured going at 10:30am during the week would provide us with an empty cinema as school was on and who goes to the movies at 10:30am anyway?! I was right, we shared the cinema with a grandma and her two young grandchildren. Lil was really good anyway, I think she was scared by the size of the screen and loud noise and didn't move anywhere!! 3. Oscar has started to show an interest in playing on the computer. He gets to have a turn most days when Lil is having her nap during the day. I want his time on here to be educational though, Carli referred me to this website. It is great, totally directed at teaching children how to read. A lot of it is a bit over Oscar's head, but he gets the gist of what to do and I figure if he keeps it up he will begin to recognise a few words by sight and hopefully when he goes to school will make the connection with the things he has been learning on the computer. The other good thing about the site is that there is HEAPS to do, so he doesn't get bored or "good at" the same few activities. Anyone else have any good children's websites to share? Im wondering how old little Lil is because she looks the same age as my Boo and I cant wait to take her to the movies but I dont think she will sit through it yet. Did Lil sit through the whole movie. We like the reading eggs website - it helped Hinckley get a head start and now she's reading advanced year two books in kindergarten. Not neccesarily all from reading eggs but it provides a good basic knowledge. Oh I hear you! We are getting it here too (I actually think you get it first and then it heads our way across the plains!) Horrible isn't it. I am pleased to see that you are making the most of the situation as best you can. The movies look like a good idea - we saw it advertised after a movie the other week - might have to take the kids if the weather is still horrid on the weekend. Fingers crossed that you get your heater fied soon - nothing better than a warm house in winter 9even if it is almost spring. awwww wilsy! her hair is soo cute!